The closing ceremony of the 7th edition of the Willem VIS Commercial Arbitration Competition, hosted and organized for the first time in Kuwait at Kuwait International Law School, has turned into a joyous Festival as participants from 13 Middle Eastern countries, numbering over 160 students, and 70 judges and coaches, expressed their appreciation for KILAW for its good organization of this event in a manner that enabled them to carry out their intensive training and workshops, competitions and rounds with ease. 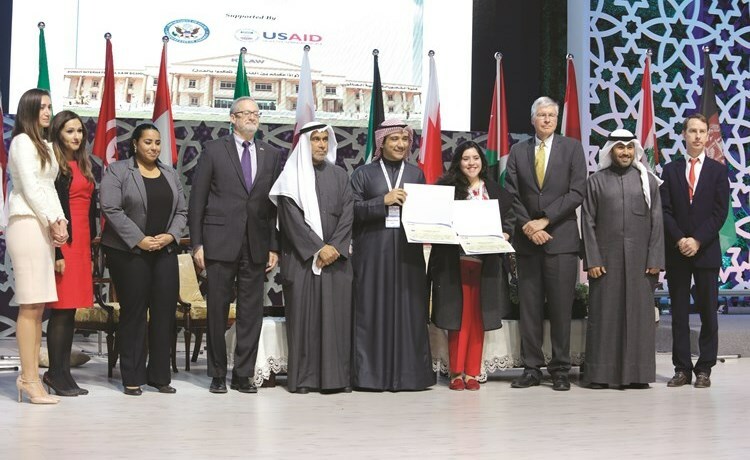 The closing ceremony of this preliminary competition was held in the presence of a large number of diplomatic and academic figures and representatives of the sponsors including Mr. Bader Al-Khalifa, Prof. Mohammad Al Moqatei – KILAW President/Dean – as well as Prof. Siham Al-Furieh and Mr. Sami Al-Abd Al-Hadi – members of KILAW’s Board of Trustees – the Assistant Dean for Student Affairs Dr. Saleh Al-Otaibi, the Executive Director of the Center for Studies and Legal Research at KILAW Dr. Ahmed Al-Faresi, US Ambassador in Kuwait Mr. Lawrence Silverman, the Secretary General of the Kuwait Center for Commercial Arbitration Dr. Anas Al-Toura, the Assistant Secretary General for Academic and Student Affairs at the Council of Private Universities Dr. Nibal Borsali, and a number of the School’s faculty members and staff. KILAW’s President/Dean, Prof. Mohammad Al-Moqatei, welcomed the guests, noting that they are “guests at this academic beacon.” He expressed his happiness at hosting and organizing this academic event in which a number of students from various regional universities participated and competed fairly, reflecting the friendliness and positivity of learners in general and law students in particular. Prof. Al Moqatei stressed KILAW’s keenness to host the seventh edition of the Willem VIS Competition, as it stems from the School’s strategic vision and mission to provide its students with all means of developing their levels and training them for such events. This competition is one of many examples of the School’s curricular and extracurricular efforts. He concluded by thanking all those who have contributed to accomplishing this achievement which coincided with the celebration of Kuwait’s National holidays. This gave us the chance to introduce our guests to the celebrations through the decorations adorning the streets of various areas around Kuwait. US Ambassador Mr. Lawrence Silverman thanked the School’s administration for hosting this event, which brings together students from the Middle East to reflect the region’s future in adopting values ​​of justice, translating what they have learned and trained as law students on the ground, especially intellectual property which the United States of America strives to protect and respect throughout the whole world, and these students will also contribute in the future to the protection of this matter. He pointed out that the US Department of Commerce’s keenness to sponsor the Willem VIS Commercial Arbitration Competition in cooperation with regional and international bodies, organizations and institutions stems from their appreciation of this competition and its role in raising awareness of the importance of arbitration in resolving disputes. On the other hand, the Secretary General of the Kuwait Center for Commercial Arbitration Dr. Anas Al-Tourah, stated that the Center is delighted with this student meeting in Kuwait after receiving the invitation of the Kuwait International Law School to participate in the seventh preliminary round of the Willem VIS Commercial Arbitration Competition, expressing his appreciation to the School administration for this initiative which was carried out in the name of Kuwait to contribute to spreading the culture of arbitration among the new generation of students not only in Kuwait but also in the Middle East. It is an achievement that we are proud of at the Kuwait Center for Commercial Arbitration and we extend our thanks to the School administration represented by the Board of Trustees and its Chairman and the School’s Dean for their efforts in hosting and organizing this event.